Since the dawn of the age of moving pictures, Manchester has been an important centre for big-screen entertainment. As for production of films, Manchester is hardly "Hollywood of the North", though some notable films have been made here, and more will be produced in the future. In the 20th century, Manchester, with its large entertainment-hungry population, was catered for by some of the biggest and most luxurious cinemas in the country. A few are still with us, but many are now only a distant memory. In the late 20th and early 21st century, cinema is undergoing a renaissance and a number of new multiplex cinemas have been or will soon be built. 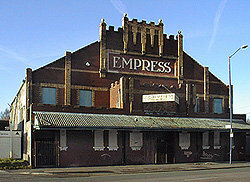 THE AMBASSADOR CINEMA at the top of Langworthy Road, Salford was in summer 2000 scheduled for demolition to make way for new houses, but in October, it was announced that after a campaign by local residents, and the actor Christopher Eccleston, it had been saved. The tiled facade is typical of the cinema construction of the early decades of the 20th century. The twin corner towers remind me of an Italian villa. In the golden age of cinema, picture houses were designed as palaces where ordinary people could escape an often dreary and poverty-stricken reality. This cinema was a prime example of this. Just loook at those corner towers and the sumptuous roman-inspired columns - I assume the A stands for Ambassador. The whole front of the cinema is like a proscenium arch, inviting people to enter and see the real one inside. Live performances also used to take place here: Violet Carson, alias Ena Sharples of Coronation Street, appeared on stage here early in her career. Developers Kelly Homes said the building is of mediocre architectural merit. Well, if those criteria were applied to most private housing developments, they'd have to be pulled down, wouldn't they? Let's just turn left from where we're standing to catch a glimpse of the future of culture and entertainment in Salford. LANGWORTHY ROAD is seen here looking from the junction with Eccles Old Road, just opposite the condemned Ambassador Cinema. In the distance on the right can be seen the glistening metallic shape of the Lowry, in Salford Quays, the former Manchester Docks. The Lowry was opened in 2000 and is the City of Salford's showpiece cultural centre. It was designed by award-winning architect Michael Wilford. Directly above the end of Langworthy Road is the Lowry multi-storey car park, and to the upper left, the stadium of Manchester United, still undergoing development and expansion, as the crane indicates. THE VIRGIN CINEMA Parrs Wood is seen here under construction - in January 2000 in the left hand picture and in May 2000 in the right hand one. Contemporary designers of multiplex cinemas design are attempting to recreate the grandeur of older cinemas, using contemporary building materials. 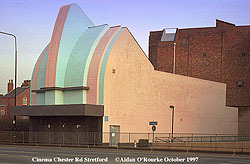 This entrance facade bears a superficial resemblance to the Ambassador Cinema, Salford, in mid-2000 scheduled for demolition. But because of the use of prefabricated, metal-based materials, the new building reminds me less of a palace of dreams and more of a quick-build factory unit on an industrial estate. Maybe it will look better when it's finished, if you ask me which is the better, more attractive and more enduring building, I'd have to say... The Ambassador. 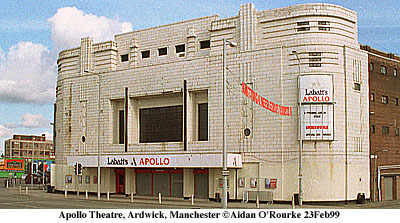 THE APOLLO CINEMA Ardwick opened in 1938, with a seating capacity of nearly 3000. It was built in reponse to a huge demand by audiences to see films, and was constructed in a modern, streamlined style reminiscent of a giant wireless set, and with a luxurious interior. It continued in use as a cinema into the 1970's - I remember seeing my first X-rated movie here. Since the mid-1970's it has been a major venue for pop music acts on tour, and in 1997 was renamed Labatt's Apollo. SALFORD CINEMA stands at the corner of Chapel Street and the new Trinity Way. It's one of the oldest cinemas in Manchester and Salford. The opulent tiled exterior has much ornamentation and like many cinemas of the time is crowned by a wonderful gazebo-like structure. I can almost imagine a screen goddess from an early 20's silent film appear at the balcony in Roman costume. The building is now used by the New Harvest Christian Fellowship - though they evidently don't have the funds to restore the exterior to its former glory, at least they are keeping a unique building in communal use. THE GROSVENOR PICTURE PALACE dates from the earliest era of Manchester's pictures houses. It stands on the corner of Grosvenor Street and Oxford Road and was opened in May 1915. Like Salford Cinema, constructed around the same time, it has a commanding Roman-style covered balcony. Down through the years, the Grosvenor Picture Palace competed well despite the appearance of newer and bigger cinemas nearby. By the 1960's however, it was in terminal decline and the last film was shown in May 1968. It continued in use as a bingo hall, then closed. More recently, the building was bought by the innovative Firkin chain, who refurbished the building and re-opened it as the "Footage and Firkin" pub with an early Hollywood theme. The mainly student clientele can enjoy their pints of lager in its cavernous interior, and imagine it in its earlier days as a movie theatre. THE ROXY CINEMA Chester Road Stretford is an amazing example of art deco cinema design, which would blend in very well on Miami's South Beach. Unfortunately, due to road widening and other adverse planning developments it its vicinity, the cinema now looks very much out of place. For years it has lain empty, but can't be demolished as it's a listed building. Finding a new use for cinemas like this is extremely difficult, but surely it must be possible. If only it could be moved easily from its present location to a better one - maybe that's the solution. 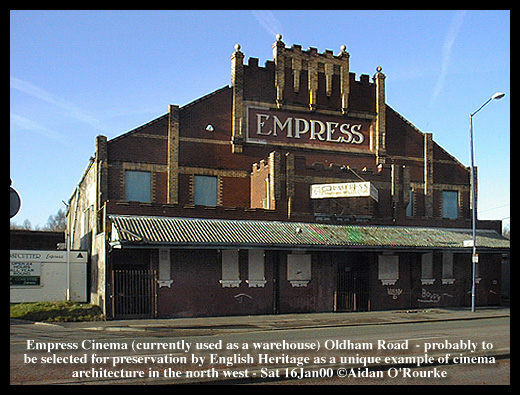 THE EMPRESS CINEMA on Oldham Road, Miles Platting is a throwback to the days when this was a busy and thriving part of Manchester, with a large local population who lived and worked here. Its distinctive pyramid-like outline is a major landmark on Oldham Road. In mid-2000 the building is used as a warehouse and is in a run down though serviceable state. In 1999, English Heritage asked people to nominate cinemas they thought should be saved - this was among those highlighted in press reports. Will it return to public use, maybe even as a film theatre? THE ROXY CINEMA, Hollinwood, is a old cinema that has moved with the times and is set to have a successful future. It's one of the few cinemas that has the privilege of featuring on road signs. It's located on the main Manchester to Oldham Road, in the south east Oldham MBC suburb of Hollinwood.